The Ocoee River is situated in the state of Tennessee and runs for 93 miles along spectacular scenery and natural forest areas. Some notable features along this river include the Appalachian Mountains, The Cherokee National Forest and three dams for generating power. However, it is the white water rapids that the river is mostly known for and the Ocoee River Rapids are so popular that whitewater events during the 1996 summer Olympics took place there. These rapids have gone on to become the most popular rafting area in the United States. 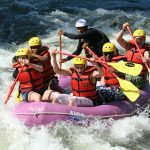 When it comes to the great outdoors, there are many adrenaline-pumping activities to pursue but none are as exciting and rewarding as whitewater rafting. The Ocoee River Rapids are considered to be safer than many rapids in their category so the river is popular with people of all ages and skill levels when it comes to water sports such as kayaking and rafting. A number of tour companies offer lessons and guided excursions down the river. These tours are generally done in groups with others who share a similar skill level. There are a variety of tours available. Some only venture to the calmer Middle Ocoee River which includes the Broken Nose, Diamond Splitter and Table Saw Rapids. Other tours venture a little further into the rougher Upper Ococee River where the Godzilla and Humongous rapids are. For a full-out adventure, there are tours that traverse ten full miles through both of these areas. When searching for a guided rapids tour, there are some things to consider. When searching through the options available, which can be found online or through the local tourist bureau, look for companies that match your skill level and abilities. Be sure to call each company first to ask if they accommodate beginners or more advanced rafters and check into their safety record. The price of a guided tour will depend on how long the tour is, whether it’s a beginner or expert tour and the time of year. While in the area, there are many other attractions and things to see and do. For starters, a number of major cities in several surrounding states are situated within a few hours of the rapids area. The river is also a great place to indulge in other recreational activities such as tubing, ziplining, hiking, cycling, bird watching and nature viewing. There are a number of picnic areas, scenic viewpoints and paved trails around the area in the Ococee Whitewater Center area which also offers a playground and various educational programs for children. This is a wonderful outdoor event that everybody will love. Around half a dozen members of the team are placed on each boat and compete with other teams. In rowing, every member of the team must contribute through rowing. By working together and in harmony, the team with the best coordination will win. After several rowing sessions, a team can come closer together and work much much more efficiently with one another at the workplace. This is a simple team building activity as you will only need a rope. Employees are split into two teams that are equally represented in terms of gender and weight. The teams pull the rope in opposite direction to see which one will be pulled by the other. With coordination and teamwork, members of the team are able to come closer together. The ideal event should have a money-back guarantee. If the event does not help to build your team, you should get a full refund. After all, you are paying for results. While the investment you make in team-building events will return many times over, you do not want to be exploited by the event organizer. Therefore, you should spend some time comparing the fees charged by the different firms before making a decision. If the cost is high, you may want to consider designing your own events.